On November 1, 2018 POGO hosted a one-day nursing seminar the day before the 2018 Multi-Disciplinary Symposium on Childhood Cancer. Topics covered included: Practical strategies to improve Patient/Family Education; CAR-T and other Immunotherapies; Survivorship in the Age of Precision Medicine; and Strategies to Maintain Optimism and Build Resilience for Pediatric Oncology Nurses. Over 90 nurses and other health care professionals from across Ontario and beyond attended the conference. Avoiding Information Overload: What do Families Actually Need to Know? A diagnosis of cancer is emotionally distressing news to process for a newly diagnosed pediatric oncology patient and their family. There is an enormous amount of information that these families require to learn about their child’s diagnosis, side effects and treatment. According to APHON’s Scope and Standards of Practice, educating patients and families about the child’s treatment, side effects, symptom management, care at home, and the family’s readiness and preferred method of learning are essential elements of the pediatric hematology/oncology nurse (2009). Pediatric oncology nurses often do not have formal training on how to educate families. Since nurses provide a large portion of education, it is imperative to have the knowledge and skills required to facilitate this transfer of knowledge. The understanding of health literacy and clear communication are foundational principles for patient and family education. The presentation will provide educational tools focused on improving the nurse’s content and delivery of information and ability to facilitate client-centered learning, when teaching newly diagnosed pediatric oncology patients and families. Stephanie Cox has been practicing at McMaster Children’s Hospital as a nurse practitioner in pediatric hematology/oncology since 2004. She received her Master’s of Nursing and Acute Care Nurse Practitioner-Pediatrics degree from the University of Toronto in 2004 and her Bachelor Science in Nursing from the University of British Columbia in 2000. Her clinical and research interests include the care of adolescents and young adults with cancer and the supportive care aspects of pediatric oncology therapy. Stephanie currently is the Disease Committee Nurse for the Myeloid Committee at the Children’s Oncology Group. In addition, her most recent focus has been developing and implementing improved educational strategies for pediatric oncology patients and their families. Angela Filice earned her bachelor of arts in psychology at the University of Western Ontario in 2000 and went on to complete her bachelor of science in nursing at McMaster University. She has worked in the inpatient pediatric hematology/oncology unit for the past twelve years. In 2016, she was awarded an Advanced Clinical Practice Fellowship with the Registered Nurses’ Association of Ontario entitled “educational strategies to improve content and delivery of education by pediatric oncology nurses to families of pediatric patients that are newly diagnosed with cancer.” She has delivered several nursing workshops on improving delivery of patient education. Angela has been in the Quality and Safety nurse position for the past year where she works on quality improvement projects and safety initiatives. Patients and families are overwhelmed after a child receives a cancer diagnosis. Current literature supports limiting educational content at the time of diagnosis to essential topics necessary for families to know in order to safely care for their child at home. The approach to new diagnosis education should be family-centered, and tailored to the child’s diagnosis, treatment plan, and age or developmental level. In addition, education should be multidisciplinary, involving nursing, providers, and the psychosocial team to ensure that all facets of the child’s care are addressed, including child and family coping. This presentation provides an overview of current evidence supporting the education of newly diagnosed pediatric oncology patients and families, as well as the application of expert recommendations into practice. Jeneane received her Bachelor of Science in Nursing from Georgetown University, and has masters degrees as a pediatric nurse practitioner and in nursing education from Villanova University. 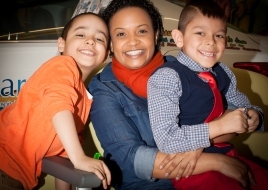 Jeneane Sullivan worked as an inpatient oncology/BMT nurse at Children’s Hospital of Philadelphia (CHOP) for 6 years before taking on her current role as Oncology Patient and Family Education Specialist at CHOP. In this role, Jeneane has built an education program for pediatric oncology patients and their families, developing resources and education from new diagnosis through survivorship. Beyond oncology, she is co-leading the enterprise-wide Digital Health Education Initiative at CHOP. In addition, Jeneane serves as the nursing member-at-large for the Children’s Oncology Group (COG). Jeneane has co-authored publications on oncology patient/family education, and is the co-editor of the COG Family Handbook: New Diagnosis Guide. She has presented on patient/family education and CHOP’s unique program regionally, nationally and internationally. This session will describe a clinical practice guideline for fatigue management in children receiving cancer treatments, developed by POGO. Dr. Lillian Sung is a Full Professor and Senior Scientist at The Hospital for Sick Children in Toronto. She is certified in the specialties of pediatrics, infectious diseases, hematology and clinical investigation. She completed a PhD in Clinical Epidemiology from the University of Toronto in 2004. She has a clinical research program focused on supportive care for children with cancer. Her methodological focus is on randomized and observational trials, meta-analysis, and patient-reported outcomes. Dr. Sung is the principal investigator on multiple operating grants from the National Institutes of Health (NIH), Canadian Cancer Society Research Institute and the Canadian Institutes of Health Research. She is the co-PI on the NCI Community Oncology Research Program (NCORP) Research Base grant which supports the Cancer Control and Supportive Care program within the Children’s Oncology Group. She is also the co-PI on an NIH R25 grant to support the Clinical Research Training Institute, sponsored by the American Society of Hematology. Pediatric acute lymphoblastic leukemia (ALL) is the most common childhood cancer. There have been significant improvements in pediatric ALL survival rates over the past 50-60 years. Unfortunately, approximately 15% of patients relapse and cure rates are much lower after relapse. Many of these patients require newer, more novel therapies and targeted immunotherapy using anti-CD19 chimeric antigen receptor T cells (CAR T) is one of those therapies. A patient’s own T cells are collected and then genetically engineered to recognize and attack CD19 + tumors. Benefits of CAR T cell therapy include expansion of the CAR T cells in the patient and potential for long-term persistence for disease surveillance. This therapy has shown encouraging results in patients with refractory and relapsed ALL. With therapies like this becoming more widely available, pediatric oncology nurses will need to understand the concept of these therapies and know the risks and side effects in order to provide care to these patients. Nurses play an important role in providing safe care and patient management. They are often the first clinicians to recognize side effects and problems. There is also a significant role for nurses in providing anticipatory guidance and education for patients and their families. Colleen Callahan, MSN, CRNP, has worked in pediatric oncology for 23 years, 18 of which as a nurse practitioner in the Oncology Division at Children’s Hospital of Philadelphia. She has worked in the Cancer Immunotherapy Program for the past five years caring for patients pre, during, and post CAR T-cell therapy in the outpatient setting. She follows these patients from their initial referral to the cancer immunotherapy team, through their T cell collection, T cell infusion, and then after infusion monitoring for side effects, adverse events, and long-term effects and responses.